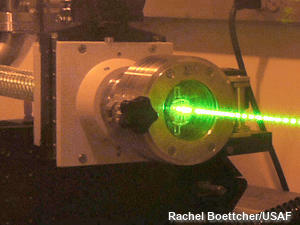 The 10 greatest physics experiments? by Chris Woodford. Last updated: November 29, 2018. Experiments power science like gasoline powers a car. If you have a theory about how the world works, it's a basic rule of science that you need to test it with an experiment. If your experiment confirms the theory, great; if not, refine your theory and do some more experiments. Although a great deal of recent science has been theoretical—especially since we started to figure out how big things work in terms of smaller things such as atoms—the history of science is, in many ways, a history of experimentation. Major milestones in how we understand the world have been marked by experiments so ingenious, so simple, and so earth-shattering that they can literally take your breath away. If a Martian were to knock on your door tomorrow demanding a quick explanation of how Earth works, you could do far worse than explain these ten landmark experiments from the world of physics. Obviously there are many more you could include here; this is my own, personal selection. Photo: There are always new theories to test and experiments to try. Even when we've completely nailed how Earth works, there's still the rest of the Universe to explore! Laser experiment photo by Rachel Boettcher courtesy of US Air Force. Photo: Galileo proved that different things fall at the same speed. Italian scientist Galileo Galilei spent a lot of his time trying to figure out really fundamental things about how the world works, including light, motion, and gravity. In 16th-century Italy, science was still largely dominated by theories that hadn't changed much since the time of the ancient Greeks. One really influential Greek scientist, Aristotle, had famously argued that heavier objects fall faster, so a feather and a stone fall at different speeds because the stone weighs more. In perhaps his most famous experiment, Galileo proved this was false. Apparently he dropped balls weighing different amounts from the Leaning Tower of Pisa in Italy. Despite their different weights, the two balls reached the ground at exactly the same moment—proving Aristotle was wrong. According to Galileo, a feather will hit the ground more slowly than a stone because air resistance slows the feather down as it falls. 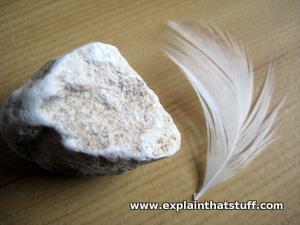 Interestingly, when scientists from the Apollo 15 mission went to the moon (where there is no air resistance to slow feathers down), they carried out the feather and stone experiment with a very satisfying result, as you can see in this video clip from Wikipedia. Photo: Nature recreates Newton's famous experiment! Everyone loves a rainbow, but where do those amazing colors come from? 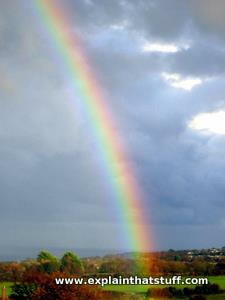 Most people understand that raindrops split sunlight ("white" light) into its component colors, bending or refracting different wavelengths by different amounts (blue is bent more than red so it's always on the inside), but if you'd been around before 1672 you wouldn't have known the answer. The classic experiment that showed how ordinary light is made up of different colored light was carried out by English scientist Isaac Newton, unquestionably one of the greatest scientists who ever lived. He trained sunlight from his window onto a triangular-shaped wedge of glass (a prism) and split it into dazzling colors. In Cambridge, England, one of the world's greatest physics laboratories is named for Henry Cavendish, an 18th-century scientist who weighed the world. Quite an undertaking, you might think! Actually, Cavendish's famous experiment involved measuring the density of Earth, from which its mass (or weight, if you want to be informal about it) can be calculated. His apparatus was relatively simple. He had two small balls mounted on the ends of a stick and two larger ones mounted on a second stick. The larger balls would swivel back and forth, attracted by the gravitational force that the smaller balls exerted on them. Here's a short video clip from YouTube that shows you how the experiment was arranged. With this apparatus, Cavendish was able to figure out both the density of Earth and an important, fundamental constant called G (the gravitational constant), which later became an important part in Isaac Newton's law of universal gravitation and Einstein's general theory of relativity. So the Cavendish experiment laid the foundations for our modern theories of gravity. Newton thought a light beam was like a train of miniature particles or "corpuscles" sailing through the sky, but another great experiment proved him wrong. In 1803, Thomas Young dreamed up a classic experiment. He made two narrow slits in a board and placed a light beam between them so it shone through both slits simultaneously onto on a wall behind. If Newton had been correct about light, Young would have seen a central bright area on the wall and darkness either side. 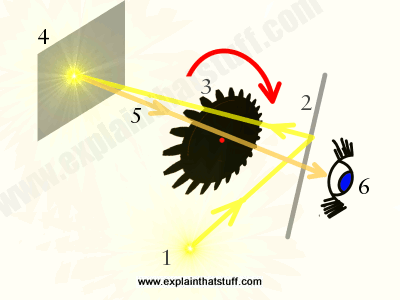 But when he did this experiment, what he actually saw was a pattern of light and dark areas where the light rays from the two slits "interfered." In some places, light from one slit added to light from the other and made a bright area; in other places, light from the two slits subtracted and left a dark area. This interference pattern proved that the light rays were traveling not as particles but as waves. Artwork: Thomas Young's famous double-slit experiment proved that light behaved like a wave—at least, some of the time. 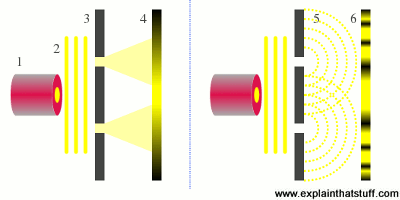 Left: A laser (1) produces coherent (regular, in-step) light (2) that passes through a pair of slits (3) onto a screen (4). If Newton were completely correct, we'd expect to see a single bright area on the screen and darkness either side. What we actually see is shown on the right. Light appears to ripple out in waves from the two slits (5), producing a distinctive interference pattern of light and dark areas (6). That might have been the end of the story, but it wasn't! In 1905, Albert Einstein proved that light could indeed behave like a particle: if you shone light on a metal, you could knock electrons out of it to make an electric current (a phenomenon known as the photoelectric effect and the science for which Einstein won the 1921 Nobel Prize in Physics). As a result of this, people came to realize that light was a particle and a wave—an idea now known as wave-particle duality, which is one of the key ideas in quantum theory (the area of physics concerned with atoms and other atomic-scale phenomena). There's a final twist on this experiment. In 1961, Claus Jönsson, a student at the University of Tübingen, used similar equipment to Thomas Young but replaced the light beam with a beam of electrons. Remarkably, he saw the same interference pattern, proving that electrons could be considered as waves as well as particles. Want to know more? Science teacher Derek Owens has made an excellent little animation explaining the double-slit experiment that you might like to watch. Artwork: The "Mechanical Equivalent of Heat"—James Prescott Joule's famous experiment proving the law now known as the conservation of energy. Suppose you want to run a marathon. A basic law of science called the conservation of energy tells us you need to fill your body with "42 km (26 miles) worth of food." Or say you want to drive a car from New York City to Los Angeles. The same law says you'll need to put about 4000km (2500 miles) of gasoline in your tank. In other words, anything you want to do needs energy to do it. The energy you need is equal to the work you want to do (and remember that "work" is the scientific name for how much effort you're putting in, which involves using a force for a certain distance). The person who figured this out experimentally was James Prescott Joule. In his experiment, there was a large container full of water that had a paddle wheel fixed inside it. The paddle wheel was connected to an axle around which a string was wrapped many times. The string was looped over a pulley and had a heavy on the end of it. 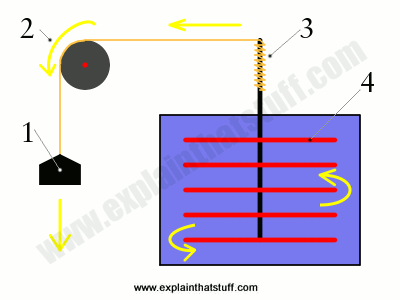 When Joule released the weight (1), it pulled the string around the pulley (2), turned the axle (3), and made the paddle wheel spin, which heated up the water. He let the weight fall about 20 times so the water heated up enough for him to be able to measure. Once he'd done all his calculations, he showed that the amount of potential energy lost by the falling weight was exactly equal to the amount of heat energy gained by the water. Energy lost = energy gained is another way of expressing the conservation of energy: you can't create or destroy energy, but you can convert it from one form into another (in this case, from potential energy into heat). Here's a quick visual explanation of Joule's mechanical equivalent of heat experiment and the earlier scientific work of Sir Benjamin Thompson, Count Rumford, on which it was based. Light travels at a blistering speed; a light beam can race seven times round the world in a second! But if light's so fast, how do we know this? How can we measure its speed at all? Speed is how far something travels in a certain time so, if you lived a few hundred years ago and you could only measure time accurately to seconds or minutes, you'd need to time light making a very long journey to calculate its speed accurately. That's why the first measurements of the speed of light were made by observing various astronomical phenomena. Artwork: How Fizeau measured the speed of light. Then, in the middle of the 19th century, French physicist Armand Hippolyte Louis Fizeau figured out a way to measure the speed of light on Earth. He shone a beam of light (1) at a half-silvered mirror (2) so it bounced through a wheel rotating hundreds of times per second (3). Like a gear, the wheel had teeth cut into its edge and the light shot through one of them. Fizeau arranged for a mirror (4) to be positioned about 8.5km (5 miles) away from his apparatus so the light hit it and bounced back the same way, coming back through it (5) and into a telescope through which he was looking (6). He knew how far the light beam had traveled, so all he had to measure was how long it took. The rotating gear wheel was effectively his clock: knowing how many teeth it had and how fast it was spinning, he could adjust its speed until it just blocked out the light from the far mirror. At that point, he knew that the light beam had traveled only once from his lamp to the mirror and back again (a distance he had measured), and he also knew how much time had elapsed between the light beam departing and coming back again. So all he had to do was divide the distance by the time to calculate the speed of light. His figure was about 3.1 × 108m/s, which was about 5 percent too high—but a very impressive result. Fizeau's apparatus was later improved by Léon Foucault, who replaced the gear wheel with a spinning mirror. This more accurate technique enabled him to measure the speed of light as 2.98 × 108m/s, which is less than 1 percent off the value we use today. The School Physics website has a great page about measuring the speed of light, showing how Fizeau and Foucault made their measurements and the calculations they used, and how even more accurate results were later obtained by American physicist Albert Michelson. Electrons carry electricity, so the smallest amount of electricity you can possibly have must be equal to the charge that one electron carries. How can you possibly measure the charge on something so small? Robert Millikan figured out a way to measure the smallest unit of electric charge by spraying oil droplets between two electrically charged plates that were suspended horizontally. After giving them an electric charge, he found he could move them up and down by adjusting the voltage on the plates, and by measuring the speed of their motion he could calculate the charge that they had. How did Millikan's experiment work? Like anything else, an oil droplet has mass so it's pulled downward through the air by the force of gravity until it reaches its terminal velocity, which Millikan measured. He then gave the droplets a negative electric charge so he could stop them falling by applying a positive voltage to the upper plate. In other words, so their weight (acting downward) was balanced by an attractive electrical force (acting upward). With the power switched on, he found that some drops fell more slowly, some stopped moving, and some even moved upward. A bit of clear thinking told him that drops must be carrying multiples of the basic unit of electric charge (multiple electrons, in other words) and this affected how quickly they rose or fell when the power was on. By measuring their terminal velocity with the power on, and comparing it to their terminal velocity with the power off, he calculated the basic unit of electrical charge—now known as the charge on the electron—with reasonably high accuracy. This important work won him the 1923 Nobel Prize in Physics. Here's a good video explanation of Millikan's oil-drop experiment by Tyler DeWitt. The ancient Greeks said matter was made of fundamental building blocks called atoms; they chose that word deliberately because it means "something that can't be split." Imagine the surprise and delight of scientists in the late 19th century when it started to become clear that atoms were actually made of even smaller things. The phrase "splitting the atom" means different things to different people. Perhaps the fairest way of looking at it is to say that it refers to a whole series of experiments that took place from about 1897 to about 1932, when a group of brilliant scientists identified the parts inside atoms and worked out how they were arranged. The atom-splitting experiments included J.J. Thomson's discovery of the electron in 1897, Ernest Rutherford and Frederick Soddy's "transmutation" experiments (converting atoms into other atoms), James Chadwick's 1932 discovery of the neutron, and one of the most famous experiments of them all: the 1909 Geiger-Marsden or gold-foil experiment. 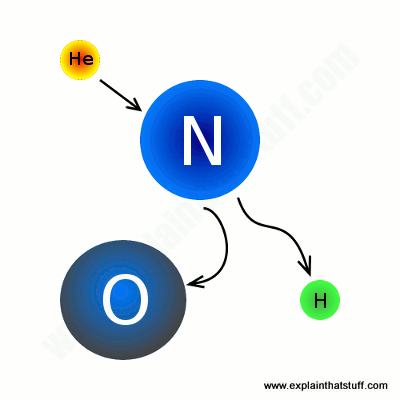 Artwork: Transmutation: When Rutherford fired alpha particles (helium nuclei) at nitrogen, he produced oxygen. As he later wrote: "We must conclude that the nitrogen atom is disintegrated under the intense forces developed in a close collision with a swift alpha particle, and that the hydrogen atom which is liberated formed a constituent part of the nitrogen nucleus." In other words, he had split one atom apart to make another one. While working at Manchester University in England, Rutherford got two of his students, Hans Geiger and Ernest Marsden, to fire positively charged (alpha) particles at a thin sheet of gold foil. As expected, most of the particles shot straight through but a tiny number (roughly one in 8000) were bent through large angles and some even bounced right back. Rutherford and his colleagues were astonished. As he famously stated: "It was almost as incredible as if you fired a 15-inch shell at a piece of tissue paper and it came back and hit you." His explanation was ingenious but simple: atoms must consist of a positively charged core (the nucleus) with electrons in the vast empty space surrounding it. Most of the alpha particles shot straight through this electron cloud and were unaffected. The few that were deflected had been fired very near (or directly at) the nucleus, so their positive charge was repelled by the positive charge there. It was this experiment that confirmed our modern picture of the atom with a central nucleus and electrons arranged around it. (This is sometimes called the Rutherford atom, which was later improved by Niels Bohr to produce the Rutherford-Bohr model of the atom). Artwork: In Rutherford's gold-foil experiment (also known as the Geiger-Marsden experiment), atoms in a sheet of gold foil (1) allow positively charged alpha particles to pass through them (2) as long as the particles are traveling clear of the nucleus. 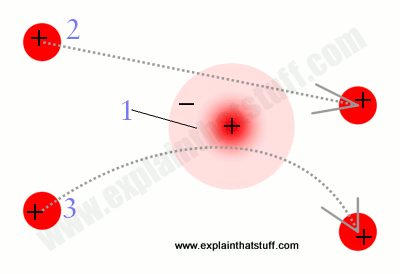 Any particles fired at the nucleus are deflected by its positive charge (3). Fired at exactly the right angle, they will bounce right back! While this experiment is not splitting any atoms, as such, it was a key part of the decades-long effort to understand what atoms are made of—and in that sense, it did help physicists to "split" (venture inside) the atom. Experiments have the power to change the world—and nothing illustrates this more profoundly than an experiment carried out by Italian physicist Enrico Fermi in December 1942. By this point, scientists had figured out the structure of the atom. Thanks to Einstein's amazing theoretical insights, they also knew that matter and energy were the same thing and that a small amount of matter could, in theory, be converted into a massive amount of energy. Putting these two things together, it followed that you ought to be able to smash atoms apart and release huge amounts of energy. Artwork: The nuclear chain reaction that turns uranium-235 into uranium-236 with a huge release of energy. Fermi tested this out at the University of Chicago with an experimental setup he called an "atomic pile." In his experiment, (1) he fired a neutron (an uncharged particle from the nucleus of an atom) at an atom of uranium-235 (uranium with a relative atomic mass of 235—in other words, a total of 235 protons and neutrons) to convert it into a bigger atom of uranium-236 (2). Uranium-236 has one more mass unit than uranium-235, thanks to the added neutron, but it is so unstable that it immediately splits up into two smaller atoms (3) and two neutrons (4). The total mass of the smaller atoms and the neutrons was less than the mass of the uranium-236 atom that had produced them—and that mass was converted into energy, according to Einstein's famous equation E = mc2. The two neutrons then flew off and hit two other uranium-235 atoms, making two more reactions happen... which then made four reactions happen... and so on. This is the famous chain reaction that powers nuclear bombs and nuclear power plants. Artwork: The double-helix structure of DNA. Photographed with X rays, these intertwined curves appear as an X shape. Studying the X pattern in one of Franklin's photos was an important clue that tipped off Crick and Watson about the double helix. It's well known that Francis Crick and James Watson discovered the structure of DNA (the molecule that carries our genetic material, with two strands weaving in and out of one another in a pattern known as a double-helix); for this superb piece of work, they shared the 1962 Nobel Prize in Physiology or Medicine with Maurice Wilkins, who had done some of the X ray diffraction studies that Crick and Watson had used. X ray diffraction works a bit like shadow-play puppetry, only instead of using a flashlight to cast shadows of your hands and make animal silhouettes on a wall, you use an X ray beam to throw precise shadows of the atomic structure of a material onto a photographic plate. The photo you get can reveal how atoms are arranged inside a crystal and the spacing between them. Crick, Watson, and Wilkins were rightly celebrated for their discovery, but one key member of the team was missing from the Nobel roll call: Rosalind Franklin, who had died of cancer four years earlier in 1958, aged just 37 (Nobel Prizes are never awarded posthumously). Franklin had taken a particularly important X ray diffraction photo, which revealed a huge amount of information about the structure of DNA. Although the vital importance of her work has been confirmed by scientists, she has never enjoyed the same recognition as Crick, Watson, and Wilkins; most non-scientists wouldn't even recognize her name. The PBS website about Anatomy of Photo 51 tells you more about Franklin's X ray photo and the things that Crick and Watson were able to deduce from it. Wikipedia's detailed biography of Rosalind Franklin explains her contributions and the failure to credit them, and lists some of the belated attempts to recognize her work since her death. Six Easy Pieces by Richard Feynman. Basic Books, 2011. This book isn't half as "easy" as the title suggests, but it does contain interesting introductions to some of the topics covered here, including the conservation of energy, the double-slit experiment, and quantum theory. The Oxford Handbook of the History of Physics by Jed Z. Buchwald and Robert Fox (eds). Oxford University Press, 2013/2017. A collection of twenty nine scholarly essays charting the history of physics from Galileo's gravity to the age of silicon chips. Great Experiments in Physics: Firsthand Accounts from Galileo to Einstein Edited by Maurice Shamos. Dover, 1959/1987. This is one of my favorite science books, ever. It's a great compilation of some classic physics experiments (including four of those listed here—the experiments by Henry Cavendish, Thomas Young, James Joule, and Robert Millikan) written by the experimenters themselves. A rare opportunity to read firsthand accounts of first-rate science!